Sun comes out, so do the legs. Then the pasty whiteness of them scares children and some adults. So I reach for some fake tan to try not to scare people in the street. But – as much as I love a bit of fake tan, I’m not a fan of the faff and time it takes. So something that speeds things up definitely catches my attention. 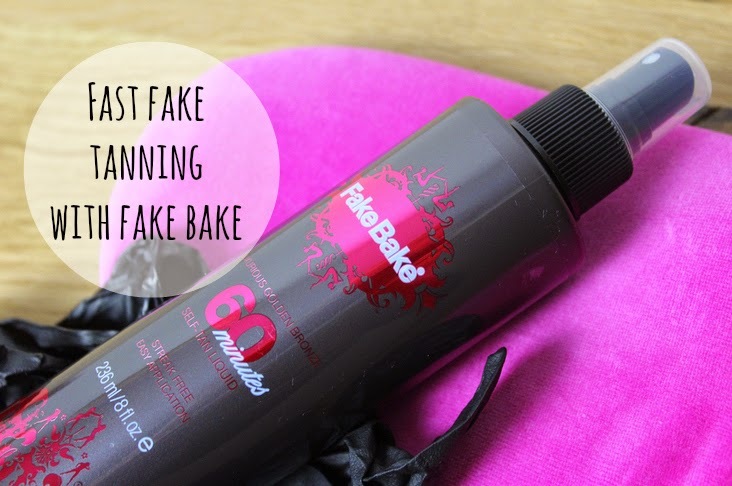 So Fake Bake recently launched it’s new 60 minutes tan – offering the Fake Bake glow that develops in just an hour. Rather than the usual three hours plus that’s recommended as developing time for most fake tan products on the market. – You can apply to get ready for a night out. I’ve previously been stuck having a panic, applying fake tan and realising that I am turning more and more bronze as the night goes on. Plus there’s only so much perfume can do to mask that fake tan smell. – No more muddy sheets! I can apply in the evening, allow it to develop and the shower off before bed. I love having white sheets, but hate the risk of sleeping in fake tan with them and how it leaves them looking a muddy looking shade. With this – sheet issues are solved! So for speed – I love! For use – also love! This comes with a pair of rubber gloves plus a spongy mitt to apply with. The tan itself is a spray liquid, that I spray straight to the mitt and buff onto skin (rather than spray on to skin then buff). I really like the spongy mitt that comes with this – it’s really great feeling, quite soft and velvety rather than just plastic. It soaks the product but not so much that it just vanishes! The liquid consistency means it’s really easy to buff into skin to avoid missed patches or streaks – liquid, mousse and gel are my favourite textures (not necessarily in that order) for fake tan. I did find that despite doing thorough scrub/moisture prep etc I still ended up with darker knees and elbows. I don’t know how I manage to always end up darker there, no matter how scrubbed I am?! Fake Bake 60 Minutes Fake Tan gets lots of Brownie points from me for speed and ease of use. Love it! As a lazy tanner – this is one for me! I LOVE THIS FAKE TAN!! It’s wonderful and it’s the only fake tan that doesn’t leave me patchy. Regarding elbows and knees (this is probably something everyone knows but I’ve only just recently learnt it)… When fake tanning those areas, make sure they’re bent and not stretched out. That way, the fake tan doesn’t settle into the creases.